Esther Casillas de Capacete will celebrate her 103rd birthday in Hacienda Heights on New Year’s Day. Surrounded by her extended family, Esther will celebrate her life alongside her nine children, 50 grandchildren, 102 great-grandchildren and 14 great-great-grandchildren. Born in 1909 in Jalisco, Mexico, Esther immigrated to the United States at age 64, after the passing of her husband, and became an American citizen at age 87. Her granddaughter Esmeralda Saldana shares some of her grandmother’s stories in an upcoming story. U.S. Air Force 1st Lt. Eric Ozburn, Paktya of Rowland Heights distributes Guardians of Peace handbills to local students during a Tandan Village outreach mission in Paktya Province on Dec 28. Ozburn is information operations officer for the Provincial Reconstruction Team. The handbills illustrate how to report dangerous activity to local Afghan Uniformed Police representatives. Seniors at the Steinmetz Senior Center in Hacienda Heights are collecting donations for the East SGV Coalition for the Homeless. The thoughtful residents will assemble bags of essentials today at 1:00 p.m. The coalition runs the winter shelter program. Last year, the 13-week program, which runs from Dec. 1 to March 15, served about 17,000 homeless people. Of that, 1,400 stayed at a shelter only once. Shelter organizers expect those figures to remain the same this time around. Area churches house about 170 homeless a night, McKennon said. “It’s a very important program in many ways because of all the different services that are available to them and we are able to get some of these people off the street permanently as a result of what we do,” McKennon said. The shelter will continue at St. Dorothy’s Catholic Church, 241 W. Valley Center Drive, Glendora, Dec. 17 to Jan. 2; Glenkirk Presbyterian Church, 1700 E. Palopinto, Glendora, Jan. 3-17; First Chinese Baptist Church, 1555 Fairway Drive, Walnut, Jan 18 to Feb. 1; St. Martha’s Catholic Church, 444 N. Azusa Ave., Valinda, Feb. 2-14; St. Matthew’s Methodist Church, 15653 Newton St., Hacienda Heights, Feb. 15-29; and St. Elizabeth Ann Seton, 1835 Larkvane Road, Rowland Heights, March 1-15. Missing from the list is long-time participant St. John Vianney Catholic Church in Hacienda Heights, which had to cancel the church’s homeless shelter this year after the its sanctuary was destroyed by arson fire in April. The church has been housing homeless since 1993 and has always had the largest number of homeless attend the winter shelter program, said McKennon, a St. John Vianney Church member. The First Chinese Baptist Church will fill the slot. “We expect to have a very sizable number come to the First Chinese Baptist Church,” McKennon said. 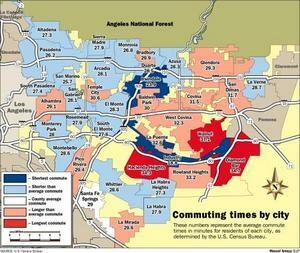 Residents of the eastern San Gabriel Valley tend to have commutes longer than the county average. The longest commutes of all belong to the residents of Walnut. On average, they spend about 37 minutes driving to work. The next longest average commute is nearly 35 minutes and belongs to Diamond Bar residents. Residents of Hacienda Heights have commutes nearly as long – slightly more than 34 minutes. The common thread among these areas is that they’re located along the 60 Freeway. As it turns out, six of the 10 cities and county areas with the longest commute times are along the Route 60 corridor. Read more in Justin Velasco’s story Commute. A young man was shot and wounded late Friday while playing basketball on a residential street, officials said. The victim and another young man were playing basketball in the street at Walbrook Drive and Olympus Avenue about 9 p.m. when a vehicle passed by and someone inside opened fire, Los Angeles County sheriff’s Deputy Russell Verduzco said. The victim, who was shot in the elbow, was taken by private car to an area hospital where he was treated, officials said. His companion was not injured. Neither man was believed to have gang ties, Verduzco added. No description of the shooter or the vehicle was available. The Hacienda Heights Woman’s Club invites women of all ages to join the group. They meet the first Thursday of every month. Meetings begin at 11 a.m. followed by a luncheon in the clubhouse at 1917 S. La Mesita Drive in Hacienda Heights. The friendly group also provides informative programs as well as entertainment. For information, call membership chair Diana Wood at 626-330-5228 or Sigi Williams at 626-333-1774. The Good Time Travel Club at the Steinmetz Senior Center will travel to the Long Beach Arena to see “Disney on Ice: Toy Story” on Saturday, Jan. 7. The cost is $16 for members and $26 for nonmembers. Dinner is on your own at Panama Joe’s at 3 p.m. The bus will leave at 10:30 a.m. and return at 6 p.m. 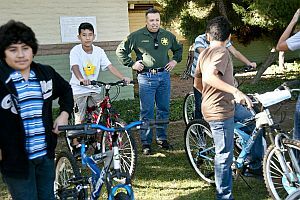 In order to share holiday joy with less-fortunate local youths, and reward positive study habits, sheriff’s officials handed out bicycles to local kids Thursday at Carolyn Rosas Park. The children were selected from a group of more than 60 primarily low-income kids based on good grades, Sheriff’s Youth Activities League coordinator Deputy Gary Vargas said. Half a dozen bikes were distributed Thursday, with several more waiting for kids who couldn’t make it to the park Thursday. Two men robbed a cell phone store of four iPhones on Thursday night. The robbers hit Speed Mobile Inc. in the 18700 block of Colima Road at 6:44 p.m.
Sheriff’s Sgt. Ramon Lascano said one of the suspects grabbed the phones. An employee tried to stop him. But the second suspect pointed what appeared to be a gun under his shirt at the employee, Lascano said. The robbers then ran off with the phones. They were described as Latinos, between 20 and 30 and standing between 5 feet 7 inches to 5 feet 10 inches tall. One weighs 150 to 180 pounds while his accomplice was between 200 to 230 pounds. Tiny Tikes Basketball is coming to Steinmetz Park in Hacienda Heights. The miniature basketball court is awesome and even I can dunk the ball on the low hoops. Families can sign up their kids 3 to 6 years old. The cost is $40 for eight weeks and include team jersey, shorts, pictures and trophy. Practices are 4 to 6 p.m. Tuesday and Thursday beginning Jan. 10. Games are on Saturday mornings, beginning Jan. 21. Read more in an upcoming story.